One dining experience that should not be missed while visiting the Bahamas is a Fish Fry. 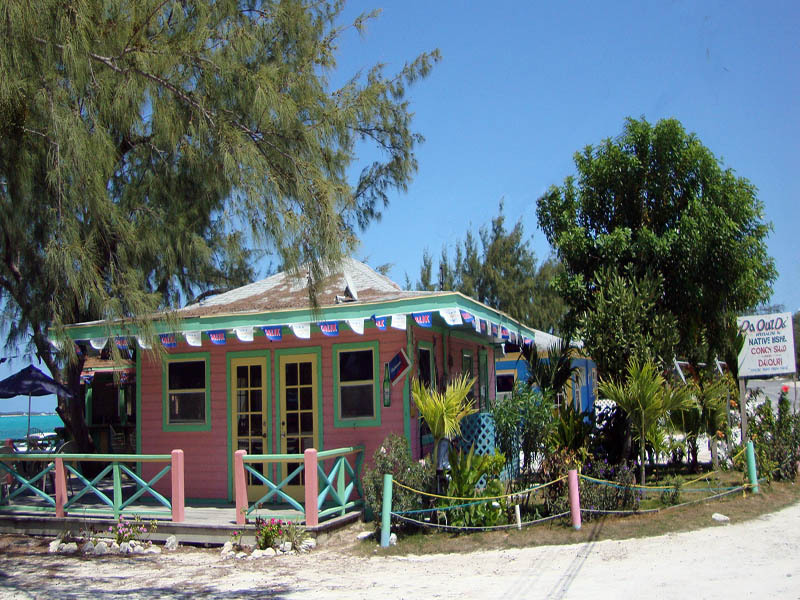 Although it sounds like an activity, it's actually a collection of rainbow-hued stalls or shacks that are clumped together somewhere on most every inhabited island of the Bahamas. And although it sounds like very specific fare, fried fish is just one of the many offerings often found at these casual eateries. One item that will definitely be on the menu is Conch made in various, uniquely named ways. There's Cracked Conch, which is fried like a fritter. There's Conch Salad, which is made ceviche-style doused in citrus juices and spicy peppers. And then there's Curried Conch, Steamed Conch, and Conch Chowder – all of which are pretty self explanatory. There might also be grilled lobsters, baked crab, barbequed pork, and jerk chicken each served with traditional sides like plantains, pigeon peas and rice, and Johnny cakes. Wash it down with a cold Kalik beer and top it off with some guava duff – YUM! We took an easy dinghy ride to Georgetown's Fish Fry, where almost a dozen huts were scattered on a sandy patch of coast. Of course Friday was the night the town turned out to unwind under the star studded sky, so we finally had the opportunity to immerse ourselves in the local gossip. After perusing the available specialties, we landed at Poor Man Kitchen, advertised as 'Where the dollar goes a long, long way!' Perfect for a couple of wayward sailors squeezing the cruising kitty of every last coin. Elbow to elbow with the islanders, we perched on barstools to watch Emmett, the owner and chef, make our meals. "You wanna try da tambran wit dat?" Emmett offered. "Yes, please!" I accepted, then inquired "I've seen several different trees with brown pods dangling from them. 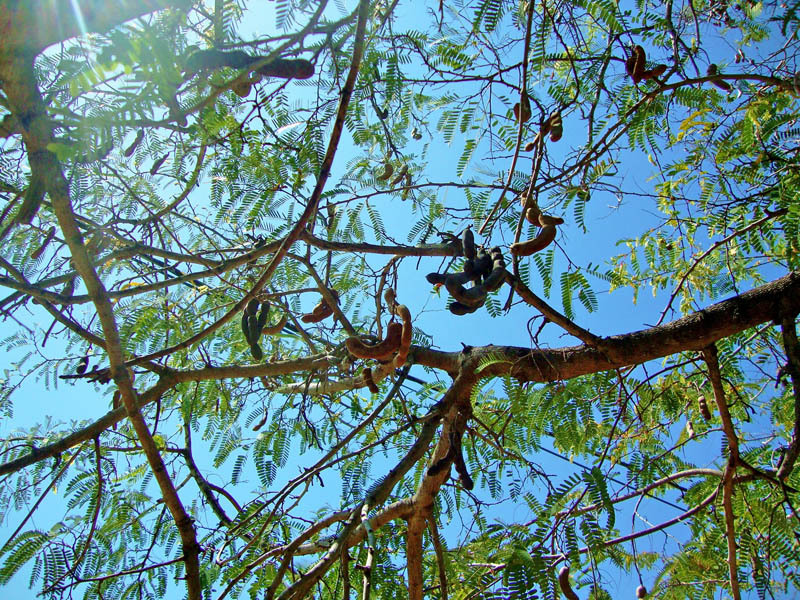 How do you tell the tamarind trees from the others?" After a little further banter, I divulged my interest in plants and wild foods. Grasping my enthusiasm for the vegetable kingdom, Emmett revealed that his mother was known as the 'Bush Medicine Woman' in his village, and offered to take us to see her garden. 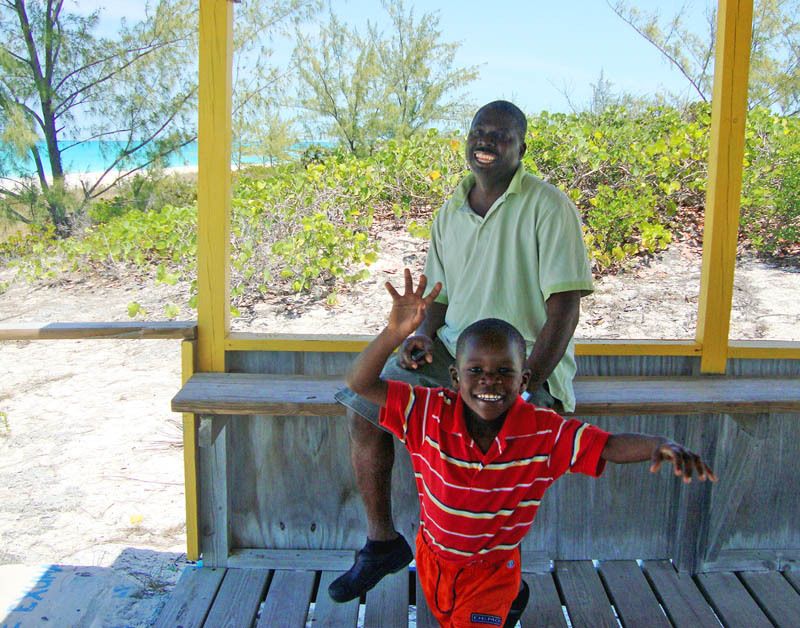 We were astonished at such a generous proposal, but had grown to know this kind of hospitality is just the Bahamian way. The next morning, Emmett arrived with his youngest (and extremely cute) son, Eric. We all piled into the SUV and headed south. One of the drawbacks of traveling by sail is that our experiences are generally narrowed to coastal harbors. And so much of Great Exuma's coast is not only unprotected, but extremely shallow making it unnavigable for a deep draft such as ours. So what a treat it was to see a part of the island that was otherwise inapproachable by our boat! 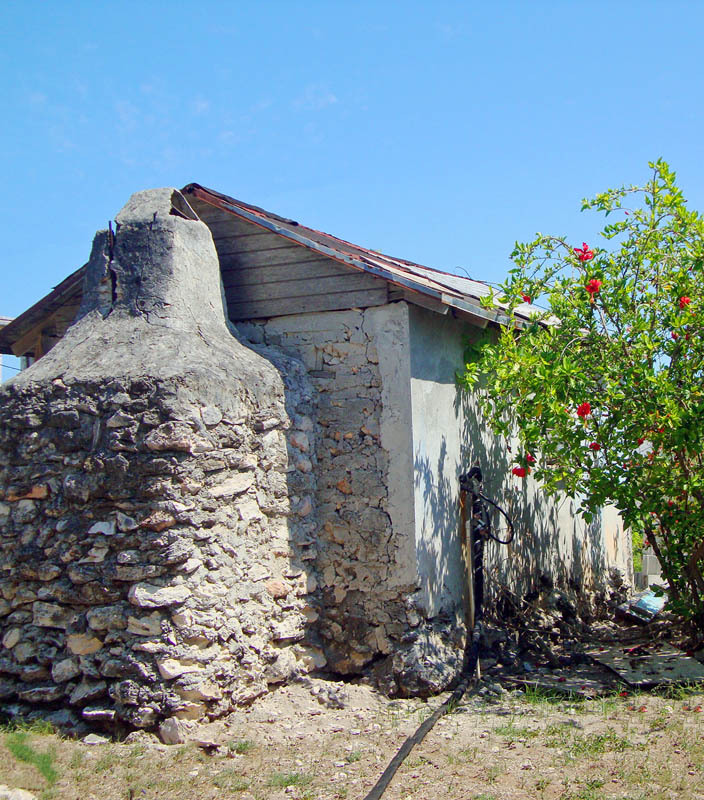 Emmett informed us that his mother was visiting another of the Family IslandsThese are also known as the Out Islands, or any inhabited Bahamian island excluding Grand Bahamas and New Providence Island. for a few days, but that was no cause for cancellation. He'd absorbed a lot of her special knowledge, and was eager to show off his island! "First, I gon take yinna ta da mos beudiful wader dere is en da Bahamas." Emmett promised. It seemed logical to surmise that he just had a special affinity to the place he called home. Because seeing an ocean view more spectacular than what we'd already witnessed thus far was unimaginable. Queen's Highway was wide open as we crossed 'The Ferry' over to Little Exuma Island. (The Ferry is either the name of the bridge or the channel, not an actual ferry. I find Bahamian naming seems more to confuse than to clarify!) The sparsely populated terrain wove around salt ponds and palm scrub. Anyone walking along the side of the road was a relative, so Emmett would pull over every now and again to give a lift to his cousin, or his brother-in-law, or his nephew. When the back of the car filled up, Eric cozily climbed into my lap. But when it emptied out, he stayed put. Emmett teased that his son always liked 'white women.' I didn't mind one bit! 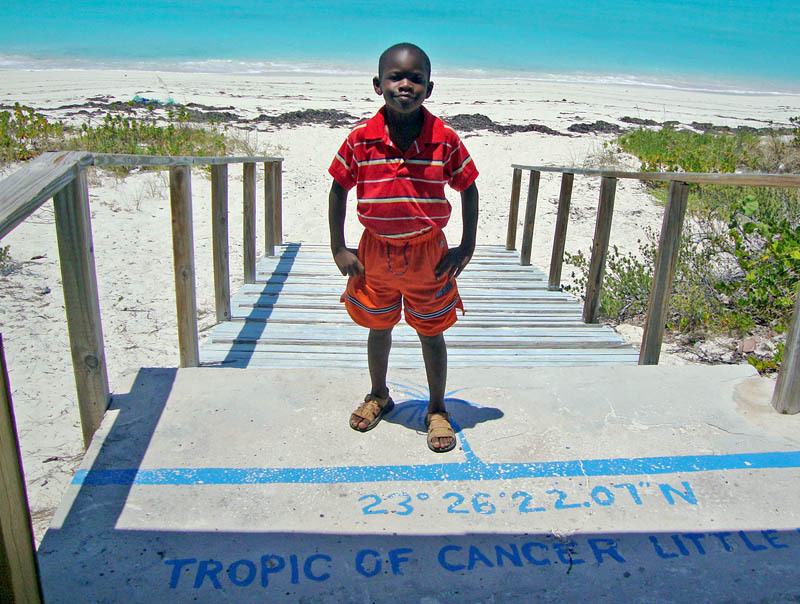 We turned onto a bumpy, dirt road that seemed to be of no consequence, and came to a dusty stop in front of a weathered wooden shelter with a hand painted sign that read Tropic of Cancer Beach 23° 26' 22.07" N 75° 35' 49.41" W. The steps leading down to the shore on the other side of the shed landed us right on top of one of Earth's major circles of latitude. And Emmett did not overstate his home town's ocean view in the least! We were privy to an exquisite arch of brilliant white, powdery sand circumscribing an unbroken vista of translucent, electric-cyan water. There are not enough colors of blue paint on any palette that could replicate this masterpiece! The brilliant sunlight directly overhead sparkled across an implausable canvas of pure turquoise, fluorescent aquamarine, and neon azure swirling and swelling together like a nebula. 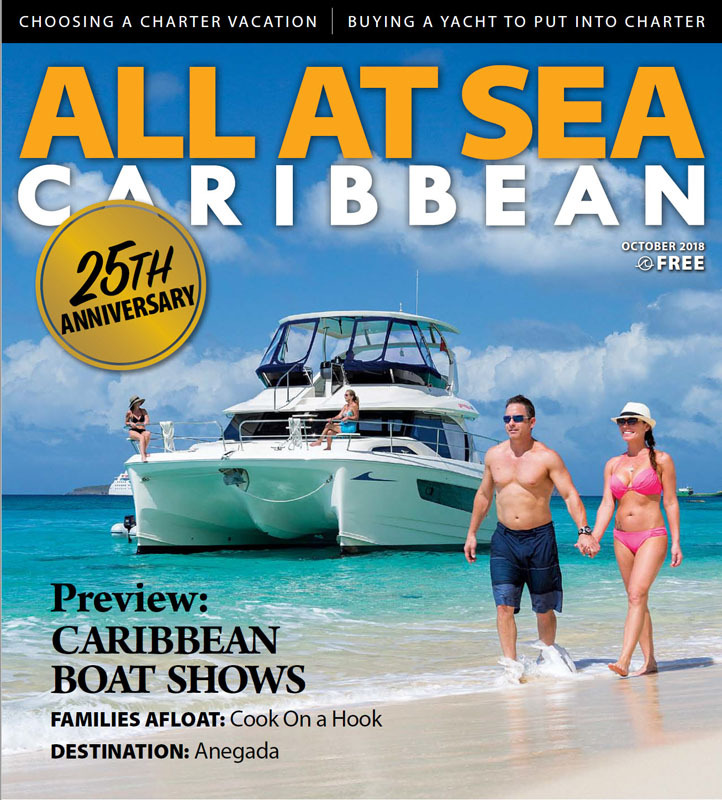 The Cruising Guide committed a few, succinct sentences to Little Exuma, touting a bakery, a couple of churches, some salt markers, and a loyalist ruin. But not a word was devoted to this treasure! No sign off the main road indicated that such an opulent gem lay at the other end. Nary another living soul roamed the pristine coast of this well-kept secret. 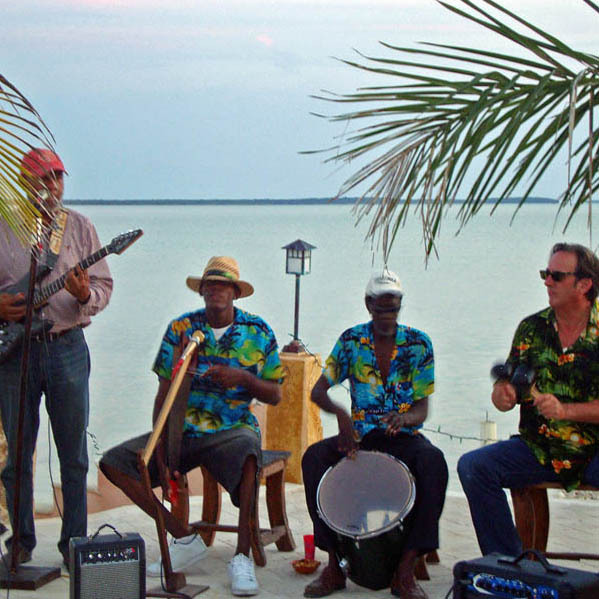 We could not have been more grateful to have become acquainted with a local islander who was eager to take us off the beaten path, and unveil "da mos beudiful wader dere is en da Bahamas!" After wandering around under the blazing sun, Emmett suggested refreshing rum punches at Santana's Grill Pit just down the road. This brightly painted, open-air hut with the most beautiful water backdrop perfectly fit the idea of that quintessential beach bar everyone imagines ambling up to in a tropical paradise such as this. Perhaps that, and its remote location was what attracted the rich and famous to this offbeat, rustic establishment. Ah well! Being chauffeured around an exotic island to exclusive locales already made us feel like celebrities. And word was Depp fell so in love with these waters that he bought an island. Perhaps we'd anchor off it and be neighbors for a bit! Our journey looping around salt ponds, passing through settlements, and transporting relatives continued until we arrived at Emmett's mother's place. It was a shady property with a profusion of trees, bushes, and greenery scattered about. Right next door to her clapboard house stood a humble stone hut where she'd raised all her children. 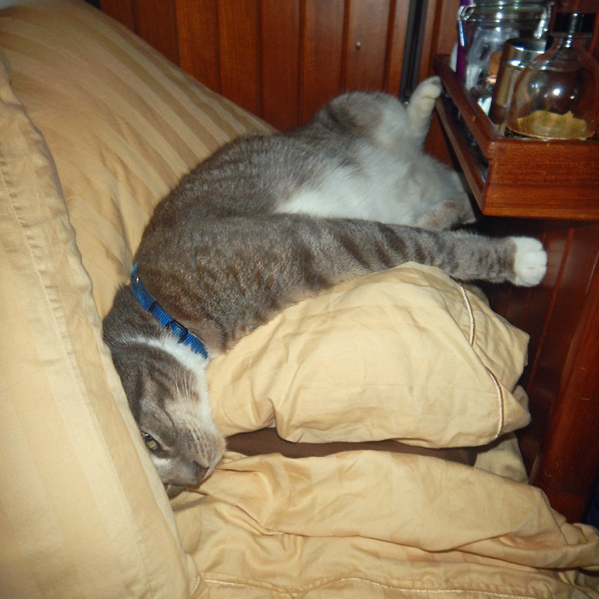 Emmett picked up on our perception of how arduous it must've been to rear his large family in such a modest abode. But then he took us to the back of the garden, peeled back some branches and revealed that beguilingly beautiful shoreline. "Dis is where we chil'en spen our day!" And our viewpoint did a 180. Don and I could see that Emmett had grown up in a very rich environment indeed! Wandering about the muddled garden, he showed us Soap Bush, Castor Bean, and Fever Grass. There was Pigeon Pea, Papaya, and Pomegranate. Every plant had a preparation and a purpose; relieving itch, clearing lungs, cooling a fever, or healing a wound. But my absolute favorite account was of the weird looking bumpy fruit Emmett called Noni. "Mama, she pick da fruit when it white. Den she boil it long till it soft, peel da skin and mash da pulp, pound pound hard. Lot a seed, strain da seed from da pulp. Den she spread it thin, put it in da sun till it dry like leather. After she soak it in water to make it soft, den heat it up in a pot." The long, drawn out recipe seemed more complicated than a Soufflé. "Was it good then?" I assumed. "NO!" Emmett's face screwed into a sour look. "It taste dreadful bad. 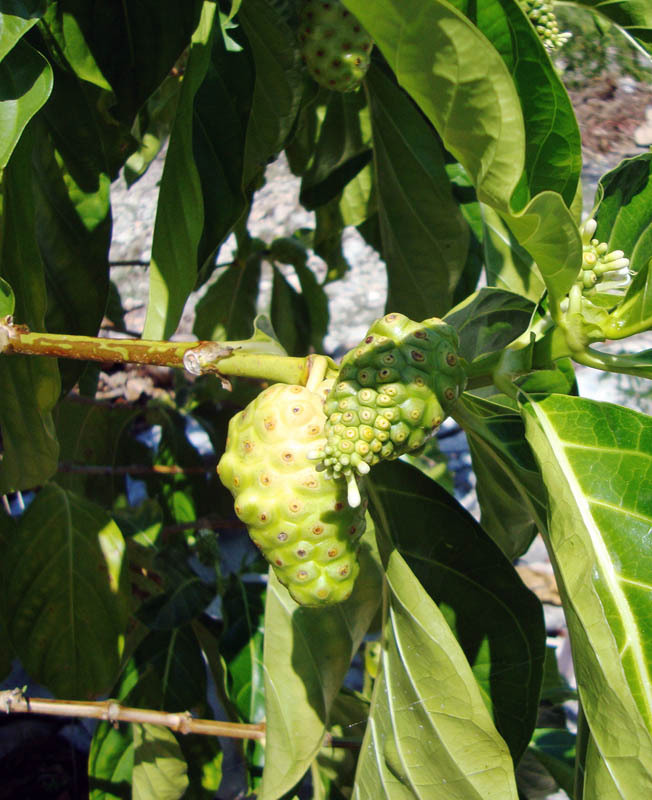 We 'ated to 'ave to eat da noni!" I couldn't help but laugh! Seems no matter where you're born in the world, you will find mothers dosing their children with nauseating concoctions to keep them healthy and strong. While Eric happily ran around his grandmother's lot, Emmett leisurely gave us many more bush lessons. 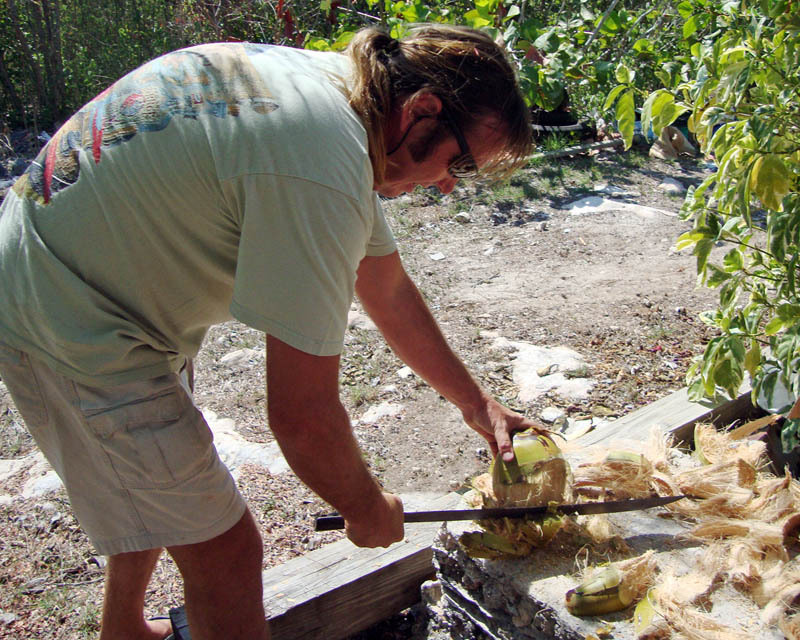 He taught Don how to machete a coconut so we could drink the nutritious water inside, showed me how to identify many other useful plants, and plucked off a couple of passion fruits for us to take back to the boat. The friendliness, kindness, and generosity shown to us by this gracious man and his incredible family, all of whom we met on the way back up island, was as unique to us as swimming pigs, rainbow hued lizards, star studded oceans, and haunted holes. 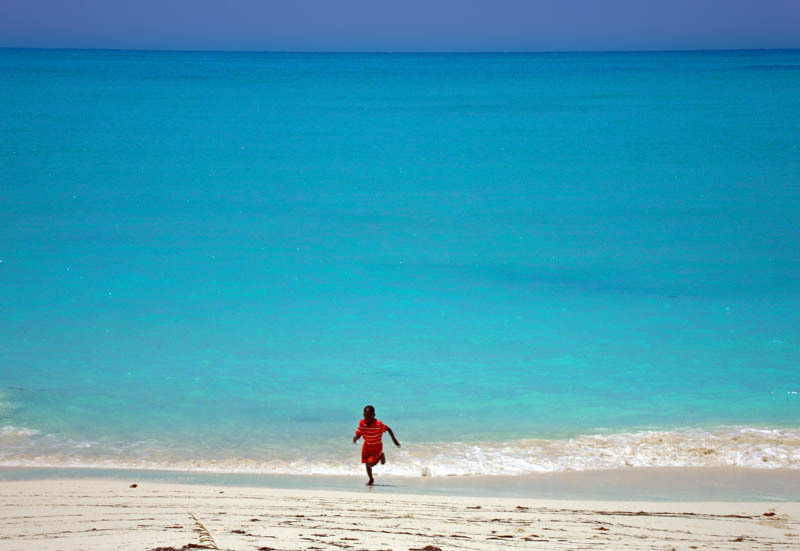 The Bahamas is indeed endowed with so many rare treasures, both in its nature and in its natives. And we couldn't thank Emmett and Eric enough for showing us their remedy for a full and joyful life!